Getting your foot in the door of a new company is tough. Job openings attract hundreds of resumes, and if you can get an interview out of those masses, you're one of the lucky ones. Considering the astronomical odds, the idea of then saying no to a job offer seems ill-advised. However, if any of the following red flags are waved during your interview, "No thanks" may actually be the smart answer. Not just weary, but he or she has trouble focusing, doesn't seem to be organized, and has a mind that wanders throughout the interview. This is a clear sign of problems in the office. Most likely, it's a combination of being overworked, overstressed, and under the gun. The interviewer is supposed to be a good representation of the company. If this is it, there are issues. Every office has its ups and downs, but for the most part, people are all swimming in the same direction. Signs that there is a rotten culture include uncomfortable body language, instantly jumping on negatives about the company and/or co-workers, and a general feeling of doom in the air. Take a walk through the building if you can. See the environment for yourself, read reviews on Glassdoor, and talk to former employees. You'll soon get the scoop. Don't dive into a fire everyone is desperately trying to escape. Whether you're working in the corridors of power on Wall Street, or a local auto-repair shop, you should know exactly what you're taking on if you accept the job. If the answer to your question, "What will I be doing here?" results in a bunch of platitudes and hyperbole, you have two possible reasons for it: Either the interviewer doesn't know the role well enough to be asking the questions, or the role itself is vague. These are both red flags that you should look elsewhere. This isn't just a red flag — it's a warning siren loud enough to wake the dead. Remember, the whole idea of an interview is for both sides to sell themselves to the other. You wouldn't talk badly about yourself in an interview, and likewise, the interviewer should be painting a positive picture of the environment. It's OK for them to talk about challenges, but if they openly rag on the company and the people, they are telling you, "Run away." Why did they leave? Did they do so of their own accord, or were they let go? Were there issues that you should know about? If you ask questions like that and are met with stony-faced silence, or some vague statement like, "We don't like to talk about that," you should consider that a red flag. Chances are, something happened that would make you think twice about accepting the job. As you sit and listen to the daily duties that come with the role on offer, make sure it aligns with the one that was posted. Is the hiring manager listing additional responsibilities that were suspiciously absent from the post? Are you being asked to do way more for the same money? This is the career version of a bait and switch. If the company is pulling this on you, it's not going to get better once you accept the job. You sit down, you do the usual banter, and you find out your resume and work history never made it to the hiring manager's desk. They know your first and last name, and that's it. Huge red flag. This is a sign of communication breakdowns within the company, a lack of process, poor preparation, and a boss that is happy to walk into a meeting knowing nothing about the job applicant. Would you want to work for anyone this lackadaisical? It happens all the time, and applicants often do it because they are desperate for the position. The hiring manager will find out where you draw the line, then promptly ask you to step over it. For example, some people in advertising refuse to work on cigarette brands or anything involving animal products. But the lure of money, or a grand title, can make them commit to a job that is at odds with their core beliefs. If this is happening in an interview, it will only get worse when you're on the payroll. It could be a combination of things. The attitude of the interviewer. A look given to you by an employee as you pass by them in the hall. A general feeling of unease. We all have an inner voice, and we should listen to it more often. Something is off, and you know it. When your Spidey Sense is tingling, don't ignore it. 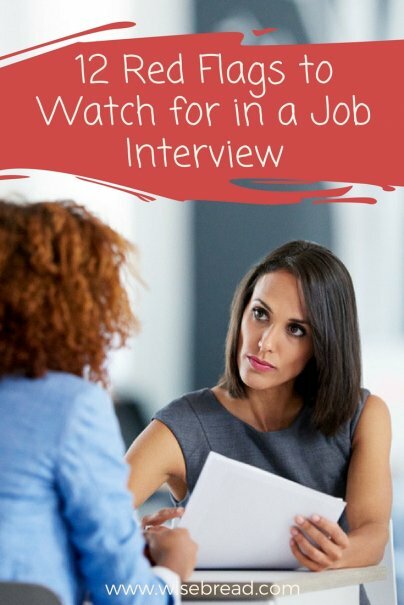 Instead, review the interview afterward, talk to friends, read reviews of the company, and figure out what set off your fight or flight response.